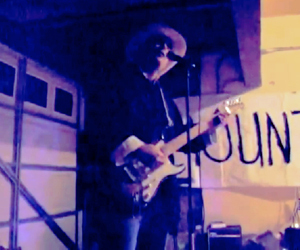 Led by Kung Fu Cowboy, the semi-immortal band Zombie Three has found a pathway to success. Signed in 2015 to Shaolin Records, Zombie Three will be recording the soundtrack to the feature film, Kung Fu Cowboy: Nazi Zombies. The title song, "Nazi Zombies," is included in their debut album, NAZI ZOMBIES. 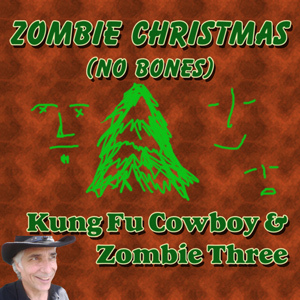 This song, "Zombie Christmas (No Bones),"
to be released February 2016 by Shaolin Records. WARNING: Consumption of this music may result in abnormal desires. Examples include wanting to read a book or apologize to an old lover. Other symptoms may include clever oration and a larger vocabulary. Should these symptoms persist, seek medical attention from a genetic scientist or local shaman burning euphoric incense. Long-term usage can produce improved judgment and erections lasting for more than three lovers. Use sparingly. Not to be used in conjunction with other resurrection products. Consult your parents before discontinuing this product. Pregnancies consummated during listening to this music may result in children who can provide you spiritual guidance. Should you die while listening to Kung Fu Cowboy & Zombie Three, we have no way of predicting where your soul will go... but for a small fee--we will have one of our zombies make an intelligible guess. When planning your "Last Will and Testament," make sure to specify that all your Kung Fu Cowboy & Zombie Three albums are buried with you so in your next life you can purchase them again in fresh tasting plastic. Emotional elation has been reported by many users of Kung Fu Cowboy & Zombie Three. Avoid consuming alcoholic beverages while listening in the bathroom. Marijuana may also produce unusual side-effects--but no one has complained about them yet. 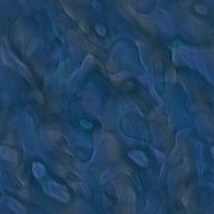 LSD users may experience "flashbacks" while listening with headphones. Photos of skin changing to greenish color or excess body parts can be posted on the Zombie Three Facebook page.